A few weeks ago, we posted a story about a chance meeting with one of our readers in an aiport. We asked you to tell us where you are from and how you learned about this blog. Today, we'd like to thank everyone who submitted comments and give you a little summary of what we learned! We were so excited by all of your responses (this post received the most comments of anything we've posted so far!) that we did a little more research using Google's website analytics feature and got even more information about where are readers are from! Since our first post in June 2009, we've had 29,867 readers from 6 continents (do you know anyone in Antartica? If so, spread the word! 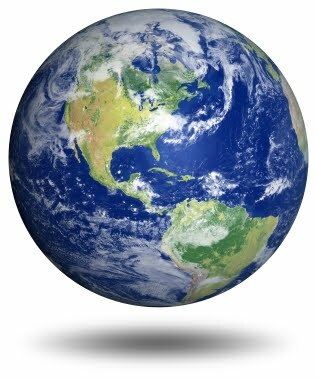 ), 161 countries/territories, and 6,551 cities worldwide! So, once again, we'd like to express our gratitude to all of our readers. For 4 moms in a small town in California, knowing that our work is reaching so many parents from so many different places brings us great joy! We hope that the information we provide on this site is useful and look forward to hearing from you in the future! Last time, we shared some basics about separation anxiety, a common behavior in infants and toddlers. In a nutshell, after the first few months babies will seek to be close to those they know best and will let their parents know (the best way they know how) that they are not happy when they go away. In this post, we’ll share a few tips to help you get through the tough transitions. 1. Avoidance is not the answer. I know exactly how tough it is to walk away from your baby, especially if she is reaching out to you with a frantic look, tear stained cheeks, and a quivering lower lip. You just want to sweep your baby into your arms and promise you’ll stay. While that might be a short term solution, in the long term, it actually sends your baby the message that validates her fear and tells her that she won’t be safe with anyone else. That’s not good for either of you. 2. “Talk it over” with your baby. Even if you don’t think that your baby understands your words, you should let your baby know where you are going, how long you will be gone, who she’ll be staying with and what you’ll do together when you get back. 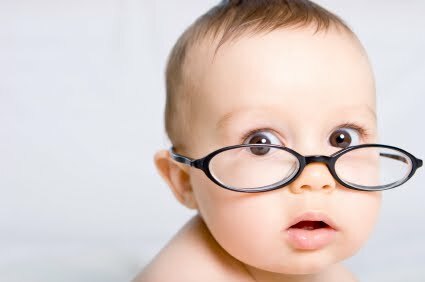 An older baby can be reassured by your words while a younger baby will benefit from seeing that you are calm and happy. Keep your explanation short and simple and don’t offer it until right before you leave. 3. Provide something familiar for your baby to keep with her. Many babies will pick toys, blankets, and other soft objects that they like to keep near them when they are tired or stressed. Maybe your baby has a favorite blanket that she sleeps with. Making sure that your baby has her favorite snuggly along can ease the transition away from you. 4. Prepare your baby’s caregiver. Make sure that your caregiver understands why your baby may be upset when you leave. Help him or her to see that your baby is likely to need a few minutes of comfort and/or distraction after you leave. With a few soothing repetitive words and actions, your baby will be ready to play in no time! 5. Be ready for a stormy or silent reunion. While many babies will be excited and happy when their parents come back, don’t be surprised if your baby does not seem to be overjoyed right away, particularly if your separation has been a relatively long one (like overnight). By giving you “the silent treatment” or crying for a few moments, your baby is expressing how much she missed you. By reassuring her that you missed her too and telling her about what you’ve been doing, she’ll get the message that you understand her feelings and that you want to share your experiences with her. When she’s old enough to use words, she’ll be happy to do the same. Next time: “Secrets” Readers Around the Globe! Nurturing Children and Families: Building on the Legacy of T. Berry Brazelton; Barry Lester and Joshua Sparrow (Eds). Wiley Blackwell, 2010. Social and Personality Development, David R. Shaffter, Wadsworth, 2005. Recently, we’ve had a couple of readers ask questions about babies and separation anxiety. In this post, we’ll share the basics about separation anxiety and next time, we’ll offer tips to help you deal with those inevitable separations, including traveling away from your baby. 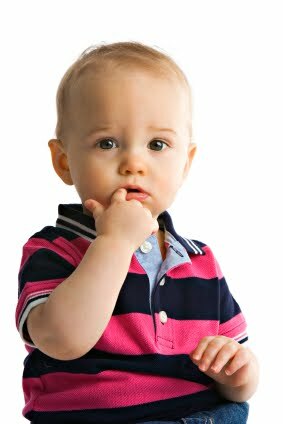 By the time infants are about 6 to 8 months of age, they start to have a much tougher time when their parents leave them. They may fuss, cry, and cling frantically to their parents even when they just look like they might be leaving. This “separation anxiety” peaks when children are between 14 and 18 months of age and is much less noticeable in most kids by the time they are 2 or 3 years old. Typically, anxious babies will cry out for their parents when they are leaving, letting them know how unhappy they are and "calling" them to come back. For many babies, this doesn’t last very long after the parent has left but of course, the parent doesn’t know that, since he or she is no longer there to see the baby calm down. Once the child realizes that the parent is not coming back right away, she will be less frantic but sad and less active for awhile until she recovers and rests, gets distracted, or starts to play again. While the response is likely to be similar at all ages, anxiety reactions in older infants tend to be louder and longer than those in younger infants. For parents, the tear stained cheeks, the outstretched arms, and obvious fear they see in their babies’ eyes are heart wrenching. And nearly every mother has a story about how horrible she felt walking away from her screaming baby, even when she was leaving the baby with someone they both loved and trusted. There are a lot of theories about why babies develop separation anxiety. Some researchers think it is a natural response to the biological need for babies to stay near caregivers, especially as they gain the ability to move away from them by crawling, walking, or running. Other researchers think that babies become afraid when they can’t explain why someone who is usually close to them is not there or when they can't predict when their parents are coming back. Others believe it is a physical reaction to the potential removal of the things that make parenting so calming for the infant (like touch, warmth, and food). Still others see the baby’s reaction to separation as a confirmation of different types of parent-baby attachment. For most parents, why a child becomes anxious when they leave is less important than what to do about it. Unfortunately, nearly all parents must face their babies’ anxiety at some point, especially in families with parents who must return to work or school. Some babies react in extreme ways to separation, while others don’t seem to mind very much. How much babies fuss and cry depends a lot on their temperament and also on their earlier experiences with separation. Understanding that babies' anxiety when parents leave is a natural part of being human can help the caregiver who remains with the baby to feel a little more confident and in control. Clearly, the anxious baby needs comfort. Calm understanding and repetition can go a long way to easing the worst of the fears. A consistent caring response will help the baby learn that he will be quite safe until mom or dad comes back. Social and Personality Development, David R. Shaffer, Wadsworth, 2005. My mom grew up as a twin and has shared fond memories (and the usual stories of sibling rivalry) with me as I grew up. Though my mom is a fraternal (not identical) twin, she has many similarities with her sister and shares a special closeness with her to this day. Growing up, each sister knew when the other one was in trouble or hurt. When my aunt married and left the house before my mom did, my mom’s heart broke over the separation. 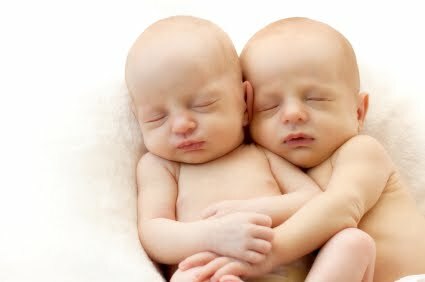 There is no doubt that twins and multiples share a special bond, and that this connection begins in the womb. In this post, we will talk about the unique bond between twins and multiples as well as the bond between caregivers and multiples. We’ll also share some ideas to help parents of multiples bond when their attention is divided among multiple babies. While multiples develop a distinct bond with each other, they also develop a special bond with their caregivers. For primary caregivers of multiples, this bond can be more challenging to develop simply because of the time and work it takes to care for multiple babies. External factors, such as each baby’s health status, can also affect the development of the mother-baby or caregiver-baby bond. Oftentimes multiples will come home from the hospital at different times based on their health and feeding status. This can be challenging for parents because they have a baby (or babies) at home to care for and a baby (or babies) at the hospital to visit and care for as well. Thus, it makes perfect sense that parents would forge a bond with each baby at a different pace. (Robin 1996) Be patient, the bond will form, it just may take longer than you planned it to. I know this is a common recommendation on our blog, but help is essential when caring for multiples. In one study, almost ¼ of mothers of twins refused help after their babies’ birth. (Robin 1996) Coping with different sleep, feeding and crying patterns in 2 or more infants can be overwhelming and exhaustion is common. We know sometimes it’s hard to ask for help, but keep in mind that levels of depression and fatigue are higher in caregivers of multiples. (Thorpe 1991) Developing a support network will be invaluable. Recognizing and responding to each baby’s individual cues will help your babies feel safe and happy. Remember, babies get better at communicating their needs to caregivers when they get practice giving cues and having their caregivers respond appropriately. For more details about responding to infant cues, click here. We hope this series on twins and multiples has been helpful to those of you out there parenting (or preparing to parent) these special little ones. For the rest of you, let us know what other topics would be useful to you in your own parenting journey! Next Time: We’ll share a short series on easing the stress of separation from your baby. Robin, M, Corroyer, D, Casati, I. Childcare Patterns of Mothers of Twins during the First Year. J. Child Psychol. Psychiat. 1996; 37(4): 453-460. LaMar KL, and Taylor CR. Share and share alike: incidence of infection for cobedded preterm infants. Journal of Neonatal Nursing. 2004;10(6): 6–9. Thorpe, K. Golding, J, MacGillivray, I. & Greenwood, R. (1991). Comparison of prevalence of depression in mothers of twins and mothers of singletons. British Medical Journal. 1991; 302: 875-878. Slight Detour - Does Nighttime Waking Make Babies Fat? We interrupt our blog posts on multiples to give you this special post.... Ok, maybe I'm being a little silly but I have had several people send me links to press coverage on an article that was published recently in the Archives of Pediatrics and Adolescent Medicine. Because the misinterpretation of the article could result in parents being confused or concerned, I thought we would provide our readers with our own take on this article. The Article: Shortened Nighttime Sleep Duration in Early Life and Subsequent Childhood Obesity by Drs. Janice Bell (University of WA, Seattle) and Frederick Zimmerman (UCLA). Arch Pediatr Adolesc Med 2010; 164: 84-845. Summary: The authors conducted a secondary analysis (meaning they used data already made public to look at something they were interested in) of a US government funded study that, in part, asked families in 1997 and again in 2002 to use time-diaries to record their children's sleep habits. Infants and children in the study were also measured (weight and height) at follow up. The final sample included 822 children who were between 0-59 months and 1108 between 60 to 154 months of age in 1997. They found that children in the younger group (0- 59 mo) with a short duration of nighttime sleep (in the bottom 25%) at baseline had a greater chance of becoming overweight or obese by 2002. This was not found in the older group. Daytime napping did not seem to make a difference. The Media "Take": I've seen the press coverage from more than 2 dozen news agencies and blogs; most seem to give the impression that infants and children should be sleeping 13 to 14 hours at night in order to reduce the risk for obesity. They don't account for differences in sleep patterns in infancy vs. preschool children. The Problem: The researchers grouped the children into the 2 groups for statistical and practical purposes (we don't know how many children in the study group were less than 1 year of age) but doing so was not clinically appropriate. I'm sure that the researchers would not say that parents should worry if their newborns sleep less than 10 hours at night. As all of our readers know, newborns and young infants need to wake for many reasons and that while they will sleep a total of 13 or 14 hours, it won't be all at once. The Reality: The researchers put a whole bunch of kids (from newborns to 4-year-olds) in a big group and found that sleeping more than 10 hours at night was associated with a reduced odds of being overweight later on. Having this "association" does not mean that less sleep causes kids to become heavier. The authors were not able to control for a lot of things that might have made a difference in the children's weight status. More importantly, putting kids with such different expectations for sleep in one big group isn't useful, especially when it confuses parents and reporters. It would have been better to put the infants in a separate group. But of course, the researchers didn't ask me. I hope this helps you understand this study a little better. Next time: Back to Twins! Over the last 6 months, we have been busy traveling and spreading the word about Baby Behavior. We've been to nearly every county in California (there are 58) as well as several other states, including Arizona, Maryland, Tennessee, Nevada, and Texas. With all the time we spend in airports, hotels, and restaurants, we have had great opportunities to see parents and babies interacting in a variety of situations. Just last week, while sitting in an airport, Jane noticed a couple with 2 young children, one of whom was a little fussy. She watched the father walk patiently back and forth with the drowsy and irritable baby while the mom played with the older child. Like she always does, Jane smiled at the family to show that she understood what they were going through and soon after, she started a conversation with the parents. As they talked, Jane found out that the parents had read our blog! She was so excited to meet parents who have been reading the blog and benefiting from the information! When Jane got back to the office and told me this story, I began to think about how easy it would be for people, from almost anywhere in the world, to stumble across our blog posts. 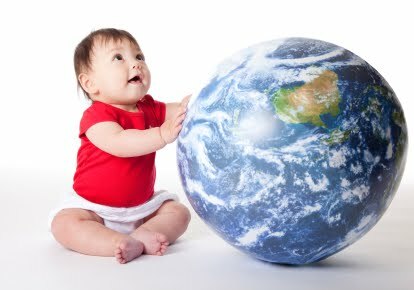 So, to satisfy my curiosity and give us a better idea about who our readers are, we'd like to ask you where you're from and how you heard about Secretsofbabybehavior.com. We'd also love to hear your ideas for future posts! To post a comment, just click the comment link at the end of this entry. Thanks!